Following her successful engagements with the National Army Museum, British Library and St George’s Chapel in Windsor earlier in the week, Ethiopia’s Minister of Culture, Tourism and Sport, Her Excellency Dr Hirut Kassaw Wondim, visited the British Museum, and the Victoria and Albert Museum in the final meetings of her visit to the United Kingdom. On her visit to the British Museum on Wednesday 20th March, the Minister and her delegation were welcomed by the Museum’s Director, Dr Hartwig Fischer, Deputy Director, Dr Jonathan Williams, Keeper of the Africa, Oceania and the Americas Collection, Dr Lissant Bolton, and other members of the Africa team. During discussions, the Minister welcomed the British Museum’s offer to renew the previous relationship it shared with the National Museum of Ethiopia while extending an official invitation to Ethiopia for the Director and his team to explore further opportunities for cooperation. Following on from this, the Minister formally requested the Museum to return 11 replica Arks of the Covenant, taken following the Battle of Maqdala, that are currently privately stored at the British Museum. “The Arks act as spiritual anchors for the Ethiopian Orthodox Church and are more than just artefacts,” the Minister emphasised. The Minister concluded by urging the Museum’s Trustees to act on this request so the Arks could return to serve Orthodox believers in Ethiopia as soon as possible. 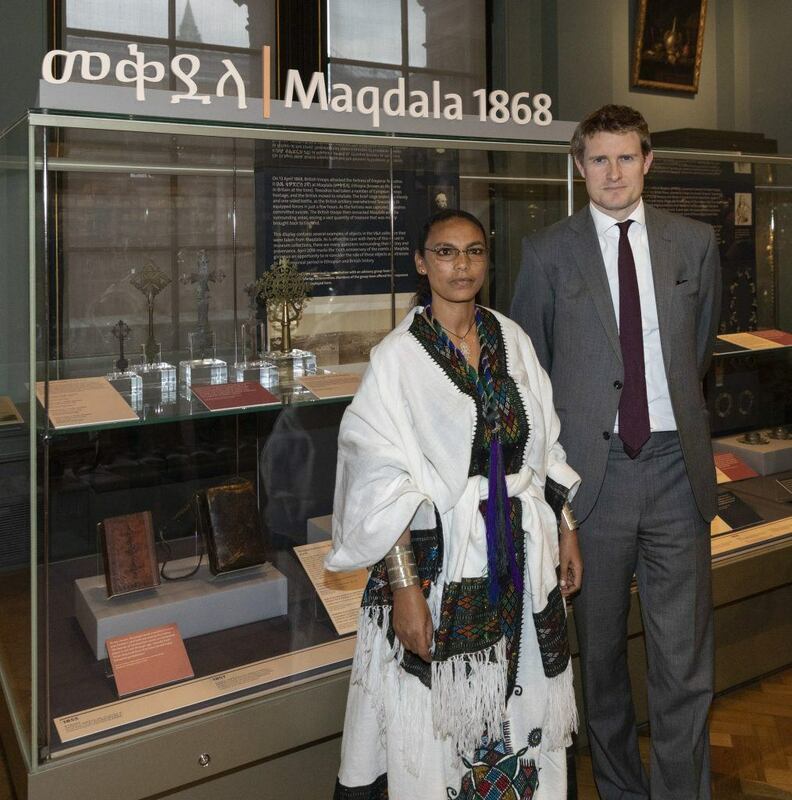 On Thursday 21st March, H.E Dr. Hirut Kassaw visited the Victoria and Albert Museum (V&A) in Kensington to continue discussions on the return of Maqdala artefacts currently on display at the Museum. 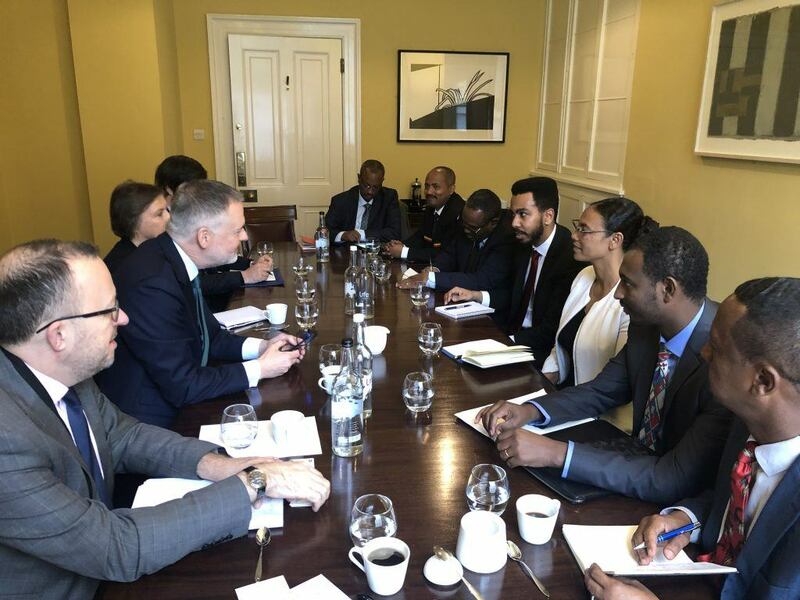 Accompanied by her delegation, which included H.E Ambassador Fesseha Shawel Gebre and the Director of the National Museum of Ethiopia, Efrem Amare, the Minister was welcomed by the Director of the V&A, Dr. Tristram Hunt and his team. On the occasion, the Minister visited the “Maqdala 1868” special exhibition, which has been running at the Museum since April last year and is due to close on 30 June 2019. During discussions, the Minister once again reiterated her call for all British institutions with Maqdala artefacts in their collections, including the V&A, to return them to Ethiopia where they hold far more significance. She emphasized that these artefacts are a vital source of knowledge, culture and wisdom and, when returned, can act as foundations to propel the future development of Ethiopia. On his part, Dr Hunt expressed the sincere desire of the Museum to see these artefacts on display in Ethiopia soon, but noted, with regret, that the biggest obstacle to this was the present status of the law in the UK which prohibits restitution. Dr Hunt, however, did commit to continuing consultations with the Minister, her team and the Embassy going forward on the return of these artefacts to Ethiopia. V & A: The V&A is the world’s leading museum of art and design, housing a permanent collection of over 2.3 million objects that span over 5,000 years of human creativity. The Museum holds many of the UK’s national collections and houses some of the greatest resources for the study of architecture, furniture, fashion, textiles, photography, sculpture, painting, jewellery, glass, ceramics, book arts, Asian art and design, theatre and performance. The V&A is currently hosting “Maqdala 1868”, a year-long display of 20 rare Maqdala artefacts, seized by British troops 150 years ago at the Battle of Maqdala.